This letter was most likely found among the estate of John/Josiah/Joe Franklin Lee, then moderator of the Shady Grove Baptist Church. The letter does not cast the Hansels in a bad light. 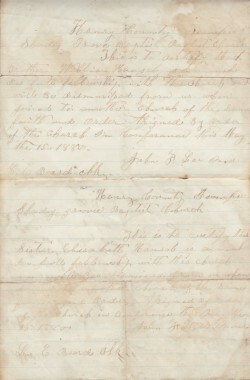 It was intended that the Hansels provide this letter to the next church they wish to attend showing proof of their good standing with Shady Grove. 15th, 1880. John F. Lee, Mod. This was written by Curtis. Posted on Wednesday, October 21, 2009, at 3:45 pm. Filed under 1880s, Beard, Churches, Hansel, Lee. Bookmark the permalink. Follow comments here with the RSS feed. Post a comment or leave a trackback.